Very seldom does it happen that when you play the “what if…” game, do all those, “what ifs…” actually happen. Today, in the EuroBasket 2013 Qualifiers there were four teams with opportunities to punch their ticket to Slovenia for next September’s EuroBasket and today all four of those teams did what they had to do. For the second time in the EuroBasket 2013 Qualifiers the Montenegro squad gave the Serbians a notch in the ‘L’ column. With the win Montenegro all but assures themselves of winning Group A. At 7-0, with Serbia, Israel and Estonia all at 4-3, and all four teams having three games remaining, there are very few scenarios that would have Montenegro not finishing in the top spot. What will be more interesting over those last three games will be which of the teams grabs the seconds spot and can one of the others finish with a solid enough record to pick up one of the four 3rd place spots. Israel has the best looking final three games as they host Iceland (Sept 5) and the Slovak Republic (Sept 8), and then travel to Serbia (Sept 11). In prior meetings with these three squads Israel is 3-0 with an average margin of victory at 19.3 points per game, the closest being with Serbia in an 89-76 win at home. Serbia is 2-1 against their remaining opponents: home against the Slovak Republic Sept 5 (93-71 win away); away against Estonia on Sept 8 (88-63 win at home); and home against Israel on Sept. 11 (89-76 loss on the road). Estonia has the toughest battle to fight with a game at Montenegro on Sept 5 (77-64 loss at home); at home against Serbia on Sept 8 (86-63 loss at Serbia); and home against Iceland Sept 11 (86-67 win away). The hosts got off to a slow start as Serbia built an 16-3 advantage late in the first quarter. Montenegro then went on an 8-1 run to end the quarter and cut the margin to 17-11. With 3:37 left in the half Montenegro had tied the score at 26 and took a 32-29 advantage into the halftime intermission. In the third quarter Montenegro was able to build an advantage of six at one point, but a Dusko Savanovic jumper with 4 clicks left on the clock cut it to four with a frame to play, 51-47. Bojan Dubjevic put the home squad up by seven with a three-ball, 30 seconds into the quarter, but that was countered by a three by Ivan Paunic. Two free throws by Milko Bjelica and a three by Sead Sehovic off a Paunic turnover extended the lead to nine. Serbia got back-to-back jumpers from Nenad Krstic and Milos Teodosic, cut the lead to five with 7:32 to play. For the next two minutes it was as if someone threw lids on the baskets, neither team could get the ball fall through. Montenegro missed four jumpers and two free throws during the span and Serbia missed three shots of their own. Savanovic ended the drought with a two-ball to slice the Serbia deficit to three with 5:14 to play. Aleksa Popovic started a 7-0 run for the hosts with a deuce, followed by a three-pointer by Sehovic and a jumper by Sekulic, extending the difference to 10 with 2:09 to play. Paunic nailed a three with just over a minute to play to pull within seven, Taylor Rochestie dropped in a deuce shortly after to put Montenegro back up by nine. Danilo Andjusic cut the margin to six with a three-ball at the 25 second to go mark, but Sehovic’s pair of free throws locked the win up and Vladmimir Dasic’s dunk as time was clicking away put an exclamation point on the end of it, 72-62. Sehovic lead all scorers with 20, Dasic added 13 and Sekulic dropped in 11 for the home squad. Teodosic contributed 13 points to the Serbian cause, while Nemanja Bjelica added 11 points and nine rebounds. Austria gave their hosts a full four quarters of pressure before the Ukraine squad found themselves with an invitation to Slovenia and the EuroBasket 2013 competition. The first have saw the hosts sitting with a 39-32 margin going into the intermission. Austria never held a lead, but found themselves down by eight then within one, back to down by six and back to within two and so on. The Ukraine squad just couldn’t put together a run to shake their visitors and even had a seven point margin with 28 seconds to play in the half get cut to four when Jason Detrick was fouled on a three-point attempt and stepped to the line to drop in all three charity tosses. On the defensive end Rasid Mahalbasic stole an errant Stiven Bertt pass, but Detrick’s jumper was blocked by Sergil Gladyr. With four ticks on the clock, Gladyr sank a three of his own to stretch the margin back to seven. Gladyr pushed the margin to 10 for Ukraine with 5:07 to play in the third with a jumper inside the arc, 48-38. Thomas Schreiner brought the visitors back to within seven with a three-ball, then Mahalbasic cut it to five with a deuce and Schreiner canned another three off a turnover to bring Austria to within two points, 48-46, with 4:12 to go in the 3rd. Davor Lamesic tied the score at 50 with 2:29 to play, but Maxym Korniyenko gave the Ukraine a two point advantage going into the final stanza with a jumper inside the last 30 seconds. Anton Maresch split a pair of free throws to open the scoring in the last 10 minutes to cut the lead to one, but that was the last time Austria was close as Oleksandr Lypovyy dumped in a three-pointer on the next trip down the court for Ukraine and Dmytro Zabirchenko duplicated the effort with a three of his own shortly after, to push the margin to seven, 58-51. They exchanged baskets for a couple of minutes then a Korniyenko dunk and a three by Bertt off a missed Lamesic jumper put the hosts up by 12, securing a seat at the EuroBasket 2013 table next September. Gladry’s 17 points paced the Ukrainian effort, while Korniyenko dropped in 12 points and snagged 12 rebounds. Austria got 13 points from Lamesic, 12 from Detrick, 11 from Mahalbasic and 10 from Nagler in the loss. 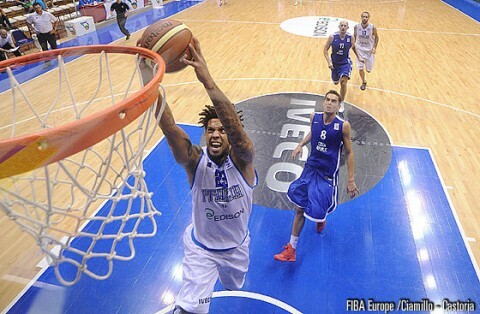 The Italians built up a comfortable margin after a half of play and then coasted to their slot in the EuroBasket 2013 meeting in Slovenia. The Czechs, who fall to 4-2 in Group F and sit in second place, have two games to play, a home contest with the winless Portugal squad (they won the first game 74-67 in Portugal); and they play Turkey at home on Sept 11 (Turkey won the first game 74-62 in Turkey). Turkey is currently in third place at 3-2 in Group F with three games remaining. Their next match-up is with Italy at home (Italy won the first game 78-69 in Italy); then they travel to Portugal on Sept 8 (Turkey won the home contest 74-62); finally, they wrap up the competition with a home contest that will most likely determine who’s making travel arrangements to Slovenia in Sept of 2013, a home game against the Czech Republic. At 2:39 to play in the first quarter the Czech’s were within two, 14-12, and that was the last time they close as the Italians went on a 14-2 run that crossed over into the second frame. With 7:17 left in the half Italy had built up a 28-14 margin. At the end of the half the lead increased to 16, 42-16. The Czechs cut that margin in the third quarter to 10 with an 8-2 run of their own to bring the score to 44-34, but the Italians countered with a 13-4 stretch to close out the quarter with a 19-point advantage, 57-38. The visitors won the final quarter 18-11, but they ran out of time and Italy walked away with a perfect 6-0 Group F record and a secure spot in Slovenia in 2013. 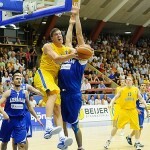 Pietro Aradori led Italy with 16 points and teammate Danilo Gallinari chipped in 10 of his own. 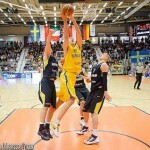 Petr Benda paced the Czech Republic with 12 points and nine rebounds, while Lubos Barton dropped in 10 points in the loss. Croatia left no doubt that they wanted to lock up their place in the EuroBasket 2013 competition with a resounding 98-49 win over host Cyprus. The Croatians have three contests remaining with the Ukraine, Hungary and Austria, but their 5-0 record, along with third place Austria’s 2-4 record, assures them of at least second place. The Ukraine has two remaining games, one with Croatia on Sept 5 in Croatia and their last contest will be in Cyprus on Sept 8. The first time they met Croatia won 80-79 in overtime. Cyprus played even with the visitors 18-17 in the first quarter and stayed close in the second, closing out the half down 40-31. The Croatians took control in the third quarter outscoring their hosts 25-16 to build up a 65-47 margin. It was the final frame that Croatia put on a shooting and defensive exhibition, outscoring Cyprus 33-2 in the final 10 minutes. The host squad was held scoreless for the first eight and a half minutes of the quarter. Croatia got 16 points from both Luksa Andric and Krunoslav Simon, while Bojan Bogdanovic added 14 points and teenage sensation Dario Saric contributed 13 to the win. Cyprus was led by Anthony King’s 20 points and nine rebounds and Panagiotis Trisokkas’ 15 points.